The Olympia Philharmonic Society, a California 501c3 non-profit organization, was established in 1988 by professional musicians in the Greater Los Angeles area. The goal is to promote musical talents in the form of classical orchestral, chamber and solo concerts. Since its inception, many world class musicians have appeared in concerts of the Olympia Philharmonic and/or Youth Orchestras, including guest conductors Daniel Hege, Masatoshi Mitsumoto, Lucas Richman, Henry Shek and Wing-Sie Yip; cellists Amy Leung and Cecilia Tsan; guitarist Pepe Romero; pianists Jean Chen, Rueibin Chen and Wendy Fong-Chen; violist Li-Kuo Chang; violinists Nai-Yuan Hu, Chuanyun Li, Walter Schwede and Jay Zhong among many others. World premiere performances were also given to works of well known composers such as Hong Diep, Daniel Kessner and Masatoshi Mitsumoto. In 1990, The Olympia Chamber Strings was also invited to a 10 day concert tour in Taiwan performing in the Cultural Centers of Cities of Tainan, Taichung and the National Music Hall in Taipei. Besides the regular Olympia Philharmonic Orchestra concerts, many chamber music concerts were also presented to the communities of Los Angeles. The Olympia Youth Orchestra, founded in 2000 for the benefit of young musicians in the Los Angeles area by the Olympia Philharmonic Society, is under the direction of Mr. Fung Ho who serves as Music Director & Conductor. Mr. Ho is on the faculty of Cal State University, Los Angeles and the Los Angeles County High School for the Arts. Mr. Fung Ho served as Concertmaster for the West L.A. Symphony Orchestra from 1992-2001 and was Concertmaster for the Burbank Chamber Orchestra from 1992-97. He now serves as the Music Director and Conductor of the Olympia Philharmonic Orchestra and the Olympia Youth Orchestra in the Greater Los Angeles area. He moved to Los Angeles in 1984 from New York City where he served as Concertmaster for both the Brooklyn Chamber and Queens Philharmonic Orchestras. He has also given solo and chamber music recitals in New York, Los Angeles, Vancouver and Minnesota. Besides keeping a busy schedule performing, Mr. Ho also maintains a studio of young and talented students. 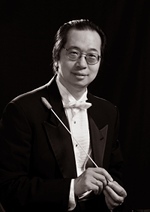 Fung Ho was President of the Los Angeles Section of the American String Teachers Association (ASTA with NSOA) and also served as President of the West San Gabriel Valley Branch of the Music Teachers Association of California (MTAC). Mr. Ho holds a Masters Degree of Music in Violin Performance from the Manhattan School of Music in New York City where he studied with the late Carroll Glenn after receiving degrees from St. John’s University in Minnesota, and Long Island University in New York. Later on, in Los Angeles, he studied pedagogy and repertoire with the late Noumi Fischer. Currently, Fung Ho is on the faculty of Cal State Los Angeles and the Los Angeles County High School for the Arts (LACHSA) where he serves as the Conductor for the String Orchestra and Chamber Music Coach. He has also served on the faculty of the International Institute for Young Musicians (IIYM) during the summers for 8 years. In the summer of 2001, he was invited by the Music Office of the Hong Kong Government to be the guest conductor at the Hong Kong Youth Music Camp and a concert with the Hong Kong Youth String Orchestra was presented at the Hong Kong Cultural Centre on July 29, 2001. Mr. Ho has also given masterclasses in the US as well as Hong Kong, Taiwan and Singapore. Many of his prize-winning students have gone on to further their musical studies in music conservatories all over the country . The Olympia Philharmonic Society, a 501c3 non-profit organization, was founded in 1988. The main purpose of the society is to promote classical music to communities of Southern California in the form of orchestral, chamber music, or solo recital concerts. Specific attention is put on the music education of children through the annual operation of the Olympia Youth Orchestra.